#3 through #12 Grade 40 or 60. All sizes and lengths available on request. Mill certified. Due to constant price fluctuations, call for current quotation. 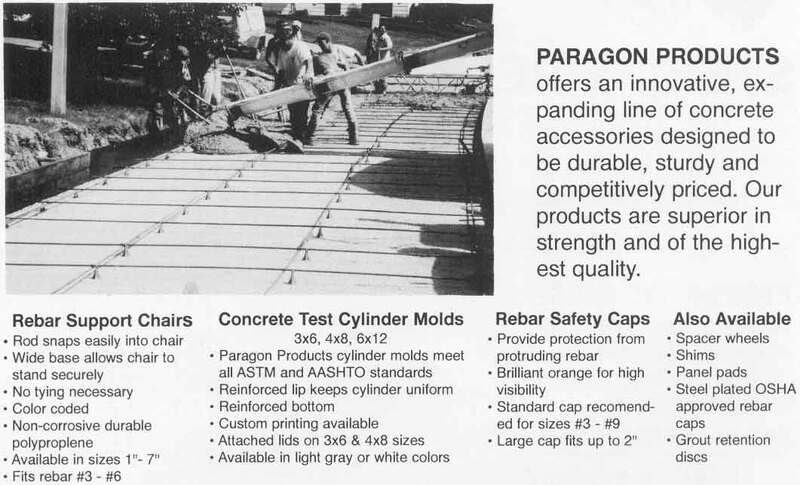 * Large cap fits up to 2"
* Available in sizes 1"-7"
The continuous systems of masonry wall reinforcing include truss and ladder designs. Various innovations are available to these various designs to meet specific wall conditions. Unit ties which are designed to tie masonry walls to steel, concrete and masonry are manufactured in various finishes and sizes to meet specific conditions as shown. 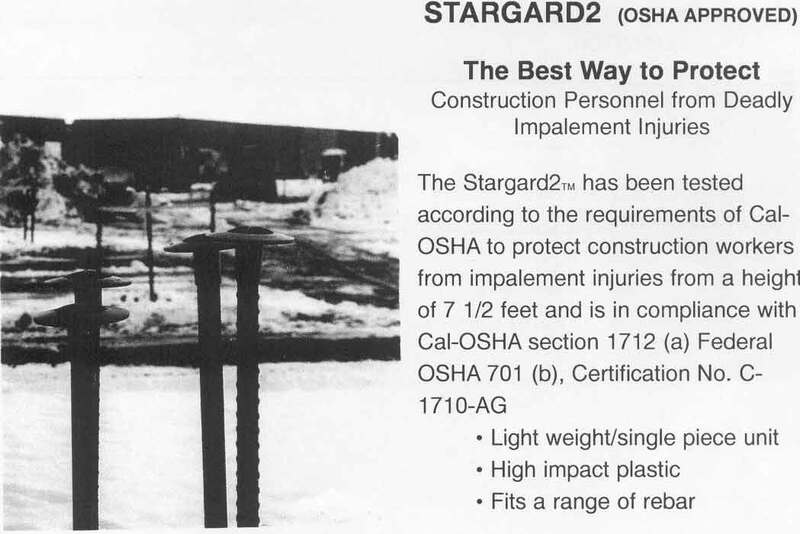 Interior walls that are non-load bearing should utilize standard weight reinforcing with a mill galvanized finish. Exterior load bearing walls need a three or four-wire system with two longitudinal wires in the block and one or two longitudinal wires in the brick as conditions dictate. Hot dipped galvanized after fabrication, ASTM A 153 Class B2, is recommended where complete protection from corrosion is required. Uneven coursing or conditions where block is laid first and brick later should use the adjustable tab or hook and eye system. An Additional advantage to the adjustable reinforcing is to provide a mechanical tie to restrain insulation in a partially filled masonry cavity wall. Click image to view the chart. 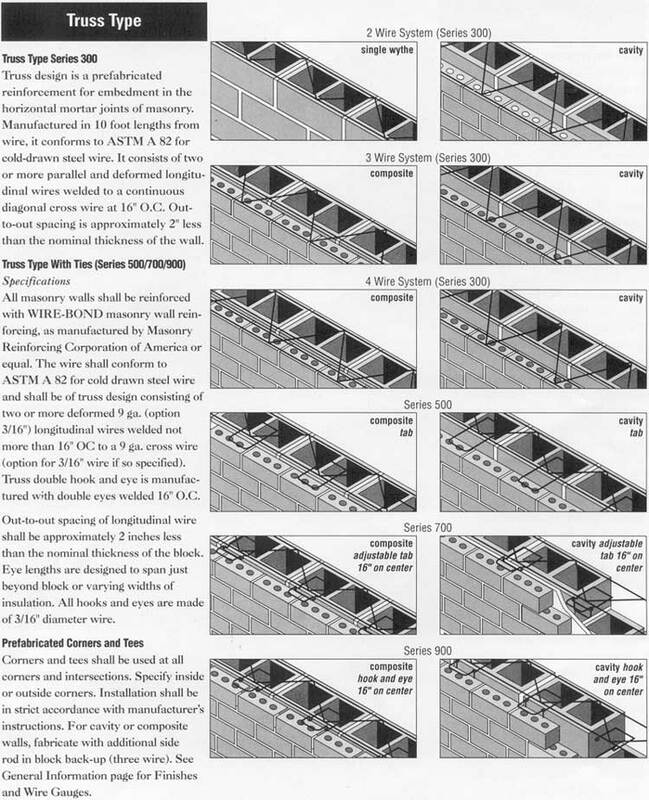 Ladder design is a prefabricated reinforcement for embedment in the horizontal mortar joints of masonry. It is manufactured in 10 foot lengths from wire conforming to ASTN A 82 for cold drawn steel wire. It consists of two or more parallel and deformed longitudinal wires welded to perpendicular cross wire spaced 15” O.C. Out-to-out spacing is approximately two inches less than the nominal thickness of the wall. 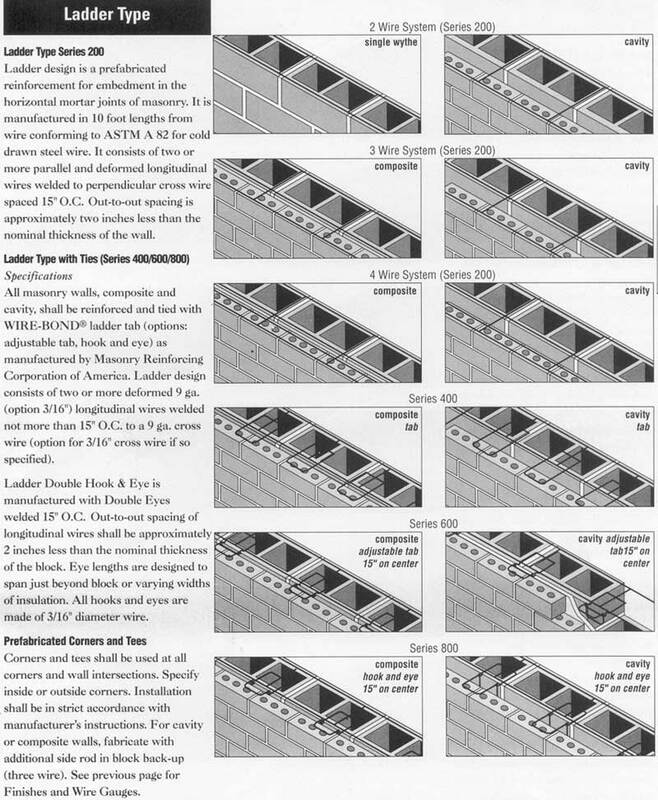 All masonry walls, composite and cavity, shall be reinforced and tied with WIRE-BOND ladder tab (options: adjustable tab, hook and eye) as manufactured by Masonry Reinforcing Corporation of America. Ladder design consists of two or more deformed 9 ga. (option for 316” cross wire if so specified). Ladder Double Hook & Eye is manufactured with Double Eyes welded 15” O.C. Out-to-out spacing of longitudinal wires shall be approximately 2 inches less than the nominal thickness of the block. Eye lengths are designed to span just beyond block or varying widths of insulation. All hooks and eyes are made of 316” diameter wire. Corners and tees shall be used at all corners and wall intersections. Specify inside or outside corners. Installation shall be in strict accordance with manufacturer’s instructions. For cavity or composite walls, fabricate with additional side rod in block back-up (three wire). See previous page for Finishes and Wire Gauges. Truss design is a prefabricated reinforcement for embedment in the horizontal mortar joints of masonry. 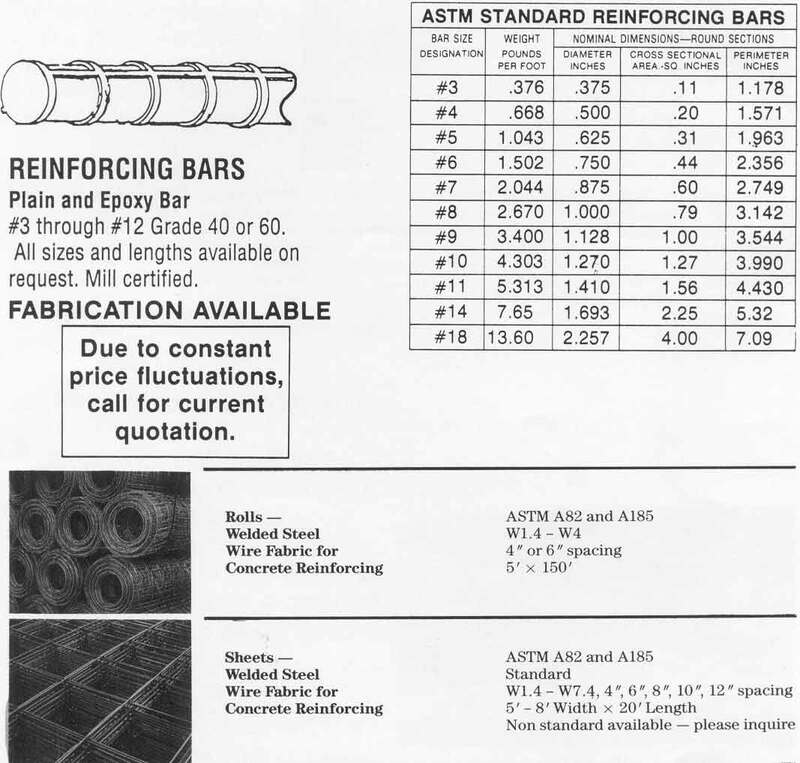 Manufactured in 10 foot lengths from wire, it conforms to ASTM A 82 for cold-drawn steel wire. It consists of two or more parallel and deformed longitudinal wires welded to a continuous diagonal cross wire at 16” O.C. Out-to-out spacing is approximately 2” less than the nominal thickness of the wall. Two or more deformed 9 ga. (option 3/16”) longitudinal wires welded not more than 16” OC to a 9 ga. Cross wire (option for 3/16” wire if so specified).Truss double hook and eye is manufactured with double eyes welded 16”O.C. Corners and tees shall be used at all corners and intersections. Specify inside or outside corners. Installation shall be in strict accordance with manufacturer’s instructions. For cavity or composite walls, fabricate with additional side rod in block back-up (three wire). See General Information page for Finishes and Wire Gauges. Plate is available in either 14 ga. or 12 ga.; wire is 3/16” diameter. Available in mill galvanized, hot dip galvanized and stainless steel. Hook lengths are 3-1/4”, 4-1/4” and 5-1/4” Hook adjustments are maximum of 1-1/4” up or down. Also available for insulated walls, Test data provided upon request. In RJ-711 chart, a tension/pull out load was applied to samples using a loading fixture positioned in a calibrated testing machine. A proof load of 100 lbs. was applied and held for 30 seconds. A deflection reading in inches was taken prior to continuing the test to failure. 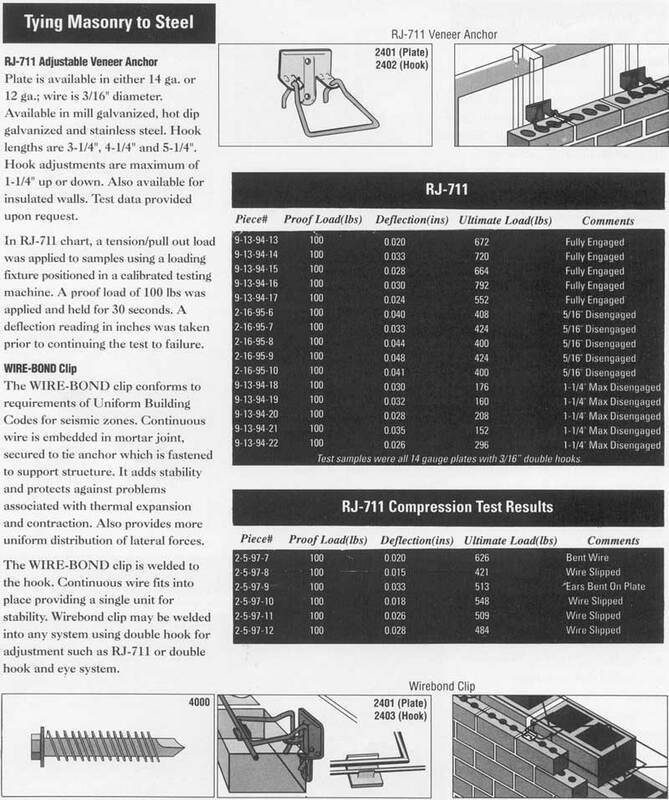 The WIRE-BOND clip conforms to requirements of Uniform Building Codes for seismic zones. Continuous wire is embedded in mortar joint, secured to tie anchor which is fastened to support structure. It adds stability and protects against problems associated with thermal expansion and contraction. Also provides more uniform distribution of lateral forces. The WIRE-BOND clip is welded to the hook. Continuous wire fits into place providing a single unit for stability. Wirebond clip may be welded into any system using double hook for adjustment such as RJ-711 or double hook and eye system. Individual or continuous ties for weld-on to steel column or screw-on to metal studs. Type 1 available in ¼” wire. Type 11 available in 12 ga. Type 111 available in 14 ga. and 12 ga. (plate). Finishes: mill galvanized, hot dip galvanized, stainless steel. 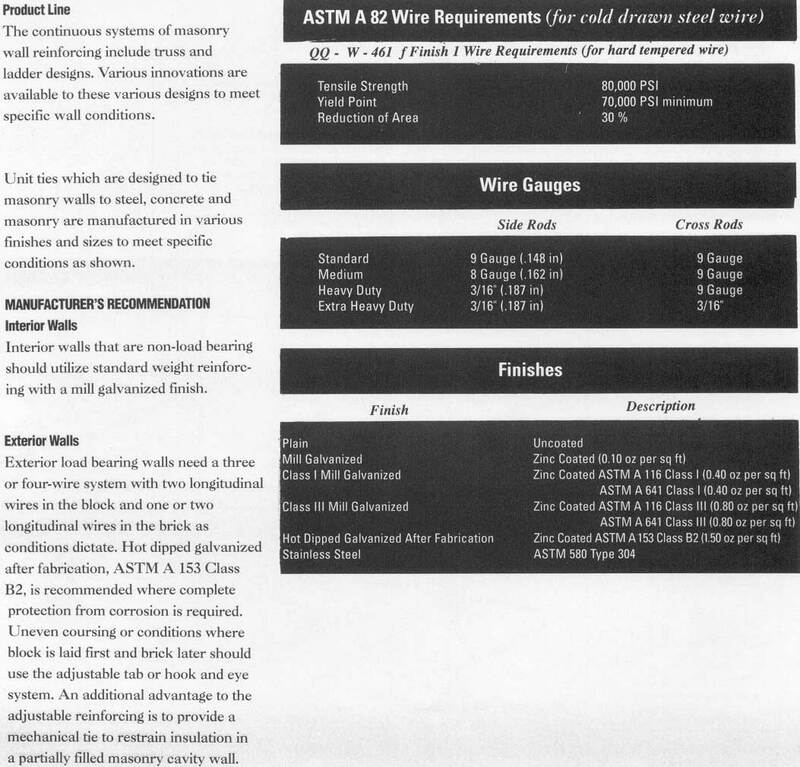 Steel wire meeting ASTM A 82 available in 3/16” or ¼” diameter. Finishes: mill galvanized, hot dip galvanized and stainless steel. A 40 mil thick dual barrier membrane, 2-1/2” wide, consisting of 32 mils of pliable, highly adhesive rubberized asphalt, completely and integrally bonded to an 8 mil, high density, cross-laminated polyethylene film. 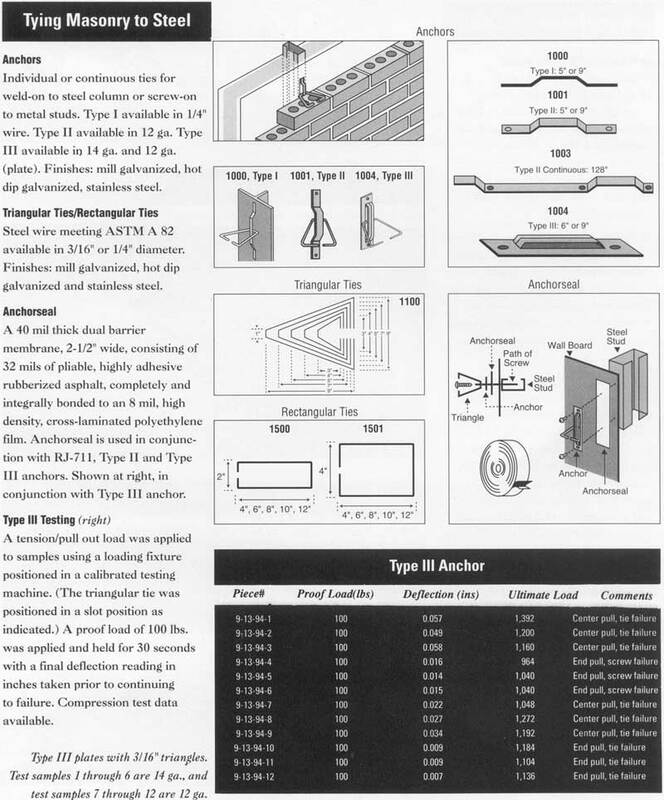 Anchorseal is used in conjunction with RJ-711, Type 11 and Type 111 anchors. Shown at right, in conjunction with Type 111 anchor. A tension/pull out load was applied to samples using a loading fixture positioned in a calibrated testing machine. (The triangular tie was positioned in a slot position as indicated.) A proof load of 100 lbs. was applied and held for 30 seconds with a final deflection reading in inches taken prior to continuing to failure. Compression test data available. Type 111 plates with 3/16” triangles. Test samples 1 throught 6 are 14 ga., and test samples 7 through 12 are 12 ga.
Click image to view chart.